Oh, the things love (and millions of dollars) can do! Beyonce Knowles bought the world’s fastest and sleekest road car, not for her, but for her husband Jay-Z. The consistent chart-topper gave her rap star hubby a Bugatti Veyron Grand Sports car which had a price tag of a whopping 1.3 pounds (and a rather impressive maximum speed of 255 miles per hour). This was her birthday gift to the rapper who had just turned forty-one on the fourth of December. Jay-Z already has quite a huge collection of luxury and sports cars, but was still very thrilled with the gift that his voluptuous wife had given him. Knowles had apparently ordered the car a year ago, so she could give it to him for this birthday this year. Jay-Z is GMC’s ambassador, and within his car collection are a Ferrari F430 Spider, a Maybach 62S, and a Pagani Zonda Roadster, among others. An insider filled The Sun newspaper in, saying that although Jay-z had an enviable collection of fancy cars coming from all over the world, the new present Bugatti is going to be very special for him. 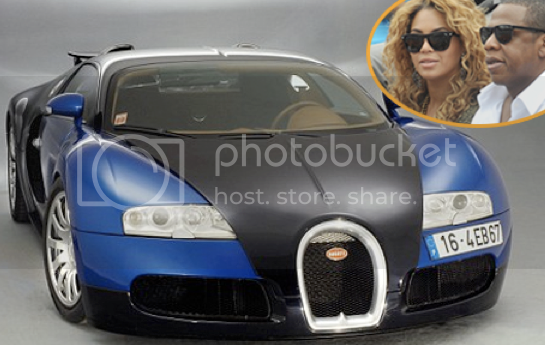 Money isn’t a concern for Beyonce, obviously, and she could have bought him something else, but the Bugatti Veyron Grand Sports auto will be something he will surely cherish for many, many years. The Bugatti had Jay-Z now has in his ownership has long been coveted by celebrities like Tom Cruise and Simon Cowell. Husband and wife Knowles and Jay-z were hailed as the highest-paid couple in the music industry in 2009, making more than 68 million pounds from June 2008 to the same month of the next year. They’ve even outdone Brangelina, who made only 33 million, and the Beckhams who were worth 28 million pounds.